There are many popular military tattoos available but those that serve the most useful are dog tag tattoos. The Civil War was the first instance of dog tag identification used for soldiers, as they had a real fear of dying and being listed as unidentified. The soldiers began pinning slips of paper to the inside of their clothing that included their name and unit. 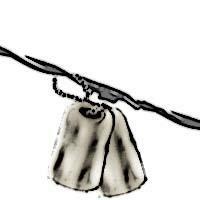 In time, soldiers began making identification tags out of wood, bored a hole near the top, and used a string to make a necklace. The Civil War was commercially successful for companies that noticed the soldiers with identification markers. They decided to capitalize on it and began making "Soldier's Pins" which could be bought via mail order. Other companies began selling engraved silver or gold identification badges prior to battles. In 1899, the dog tag officially gained advocacy by way of Chaplin Charles C. Pierce, who wanted them in field kits. The dog tag became mandatory in 1913, with every soldier wearing an aluminum discs around the neck by 1917. It wasn't until World War II that we saw the circular disc changed to the oblong shape worn today. The military dog tag, although more than simple jewelry, is fast becoming a fashion accessory. A great number of rappers to professional wrestlers like John Cena from the WWE are wearing them. Just as the companies during the Civil War saw the commercial possibilities, the trend carries on today. Dog tag tattoos have very special meanings attached to them from remembrance to practicality, to ease of mind for the wearer and their families. 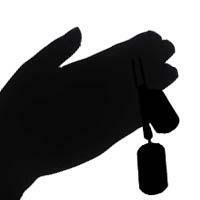 Remembrance and memorial dog tag tattoos hold a special meaning for the wearer. 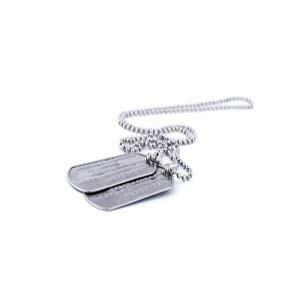 These types of dog tags can be worn by anyone, but are mainly requested by military personnel or family and friends who have lost someone. These tattoos serve as a way to remember fallen friends and comrades. 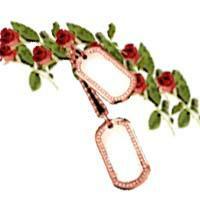 Dog tag designs are often stylized in a personal way that either means something to the wearer or to the deceased. The dog tags themselves can contain the name of the fallen friend, their date of birth as well as the date of their death. Sometimes they will contain initials, pictures or "U.S.A." on them. They can also remain blank as a way to remember all of the fallen soldiers. Tag tattoos can also be used as a means of identification, much like the soldiers during the Civil War pinned their identification to their clothing. In war, there is a high rate of casualty and with modern warfare the likelihood of coming back whole is a lot lower than it was in the 1800's. Dog tag tats, also known as "meat tags", are used by soldiers as a way to hopefully ensure that they will not go unidentified in case the worst happens. It gives them peace of mind in knowing their families won't have to wonder if they are alive or not. Placement of these tattoos varies for each soldier but many will choose an area that is more likely to remain intact. 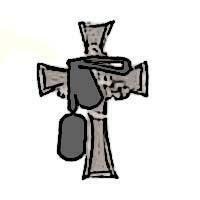 One of the most popular locations is placing the chain around the neck with the dog tag resting on the chest. Other likely places are on the top of the foot, around the wrist and on the calf muscle. To many soldiers, the stylization of the "meat tag" can be saved for when they get back home and out of harm's way. Getting too much work done on these can take away from their purpose and might go unnoticed as a means of identification. For those wanting a more stylish look, many soldiers modify the chain so that is made out of barbed wire or thorns, and often adorn the chain with sprigs of roses.